I've been feeling very reserved about Halloween this year. It just seems a bit wrong to celebrate scary things like zombies and other dead and scary things around a little boy who is so small and impressionable. It also seems to me like Halloween has lost it's meaning. If it had Christian origins I feel like they have been lost now. 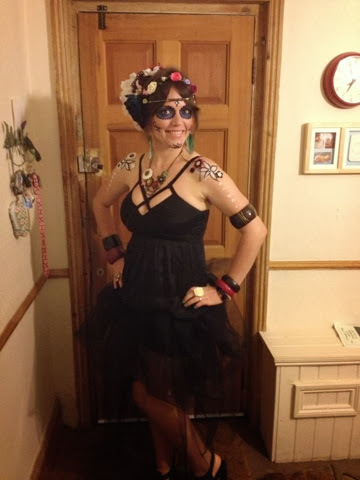 These are all reasons that I wasn't too up for celebrating this year until a good friend of mine who's birthday is the 31st October decided to have a Día de los Muertos themed party. I started researching on Pinterest and discovered the prettiness, flowers and sugar skulls all involved in this positive celebration of Mexican Day of the Dead. 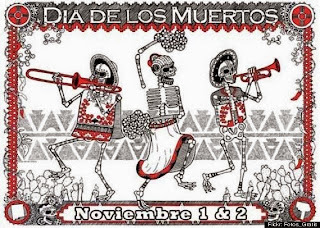 The Huffington Post describe the differences between Halloween and Mexican day of the dead like this "Dia de los Muertos is a holiday with Mexican origins that is celebrated on November 1 - 2. While some imagery might be close to that of Halloween, there are significant differences between the two. 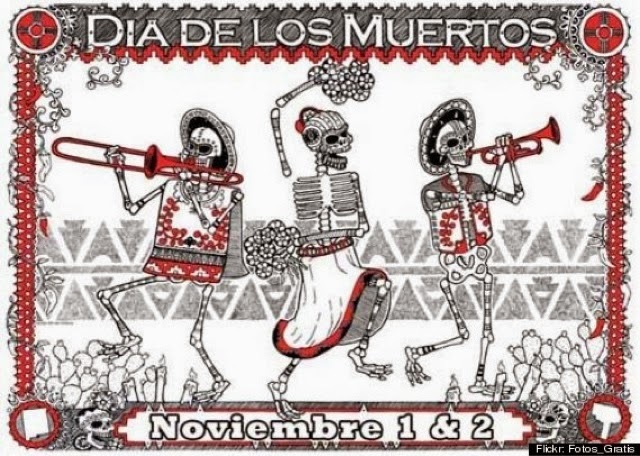 Dia de los Muertos is a day to celebrate death -- or, more specifically, the deceased -- while on Halloween, death is seen as something to be feared." I much prefer the Mexican way of celebrating rather than fearing the deceased so I'm definitely going with this idea again in the future. 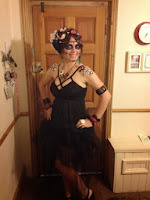 Through my research of images of make up and images I got very excited about he party and ended up with a costume and make up that I loved! I was so happy with my costume and dressed up Jacob's dad too - he looked brill! He wore a suit, hat and plain white t shirt and some stick on felt flowers sold for card making that had been fine to us by his nan! 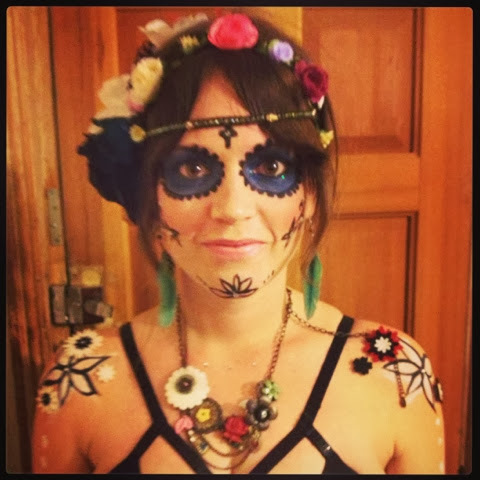 The wonderful Zoe made a Mexican feast in her beautiful home, decorated perfectly and accompanied by Mexican music and lovely people. 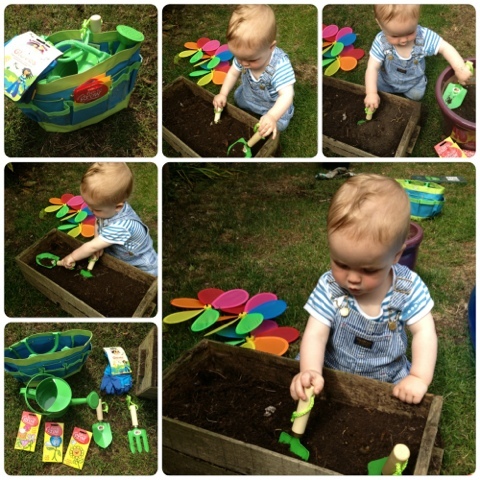 We had a fab time and the little man had a sleepover at his Nana and Pop's house so we even had a lay in the next day! It was so great to have lots of time to ourselves and have a fun carefree party time. This seemed like a much better way to celebrate the season especially as a friend of many around our local area tragically passed away this week. He ran the Dublin marathon and suffered a heart attack after completing the race. I didn't know him well but Jacob's dad and a lot of our friends knew him and he was a friendly, genuine and wonderful guy. He ran the marathon to raise money for the British heart foundation so we are continuing to try to raise money for his cause. If you would like to donate please click here to access his just giving page.